OK, I admit that I have a soft spot for Greek food. Which is the reason I was so exited to recently discover a new Greek bakery in town! 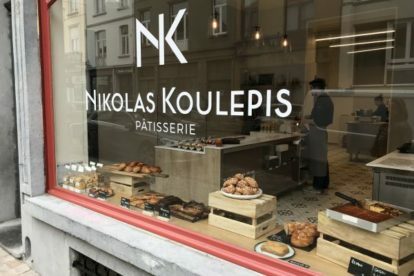 I came across Nikolas Koulepis by chance, but was immediately drawn by the Tsoureki, a type of Greek sweet bread, in the shop window. I went in, I bought, I tasted. And now, having also tried the Melomakarona and Ravani I have become a fervent fan! Nikolas Koulepis does not only produce Greek sweets though. He also has an array of French-style desserts, ranging from simple pastries, like Pain au Chocolat and Madeleine to more elaborate Tartes and Gateaux that make you want to jump behind the counter! Like any decent bakery, Nikolas Koulepis also sells savoury snacks, and being Greek, it cannot but offer a very tasty spanakopita (spinach pie)!